It was so peaceful last night all you could hear was some splishing and splashing in the dam (I think by birds foraging) and nothing else. This is one place I will NOT mention to anyone with a caravan I think! A bit late in getting up this morning due to the sun rising around 7am so the birds don't get up and make a noise until around them ... it will be better once daylight savings ends and we should be getting up around 6am and until then we will struggle to leave by 9am! yeah right kouta as if you could catch one of those birds for your meal tonight ... stick to the my dog packets you 'hunt' for each night! We did manage to get away at 9am and it is a slow 3km ride back into town on the gravel road - a few bits of soft spots and big chunks of gravel to ride through so this made the going very slow. 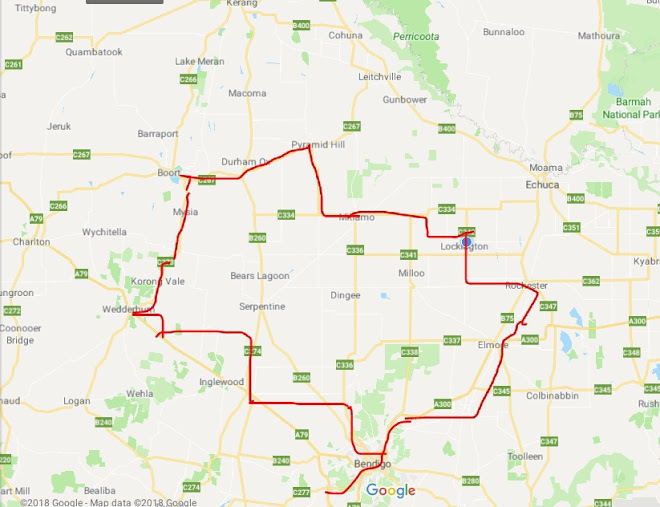 Once back on the road that goes between St Arnaud and Dunnolly we pick up speed and realised that we missed our 'woo hoos' at the 1km mark as we hit the 19,000km mark of touring since we left work. 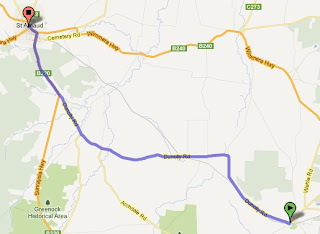 We have ridden this road before but from St Arnaud to Dunnolly and we had a raging headwind when we rode it and believe it or not we have a raging headwind again today even though we are going in the opposite direction! we have the worst luck with wind! The road is very quiet this morning so the riding was okay. It is undulating a bit but not hard. This is our 3rd day riding and the legs are okay but will be thankful for a rest tomorrow! At about 9km before St Arnaud you join the main road that links Avoca and St Arnaud so there is an increase in traffic and also a big hill to ride up - around 4km long, no real shoulder to ride in but at least the gradient to ridable although the cross headwind made it a little tough as I kept getting blown into the line of traffic but no beeping of horns so that was okay. St Arnaud is a lovely looking town, full of old buildings and little shops and the council has made an effort with its presentation of the town. It has a reasonably good supa IGA. The campground is up the hill and is council run. we are on the edge of the hill and the wind is blowing a gail (it is a westerly) we get a nice view of town but tomorrow is very little wind by a hot day compared to what we have been having so we chose this close to the edge at it gave us shade for tomorrow in the afternoon. The campground has a bbq and it is free. There is a power point by the bbq which is what I am using now. The best thing about today is the fact that we both had our first shower since Thursday evening at Bendigo - we have had 2 free nights camping in the bush and after 3 days of riding we certainly needed a shower - I felt dirty and gritty and my hair was sweaty, dirty and had to be washed twice before I could get a lather up!